It's good to be home. 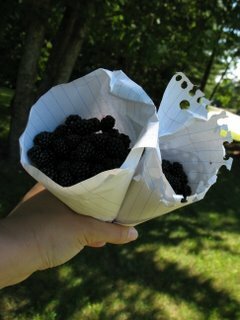 Today we were wandering in the woods and discovered blackberries! We spontaneously rolled up some pages from a notebook (the only thing we brought along with us) and filled them as fast as we could, then ate them. Photos not uploading, I'll try again later. Knit lots of dishcloths and a hat - now I want to get back to sewing!